Every time I go on a service trip I am amazed at how God works. I suppose I shouldn't be. Each trip is unique in that the group of volunteers is different, locations may vary, but God's fingerprints are always all over each and every trip. This trip proved this to be true in a big way. I remember specifically the drive from the airport to our hotel. The white king cab truck with the TerraMica logo on its side was filled with all six of us women and Jorge Sosa (sweet, brave man that he is). We were crushed and crowded, tired from our travel, but amazingly all very excited. It was an exciting trip given that it was an all women volunteer team that was going to specifically serve Honduran women. I was sitting in the front seat with Pam Apffel and we were discussing the treatment of rural women in Honduras and their specific challenges. Pam looked at me and said, "We are here to show each woman how valued she is by God and to show His love through our service." Mind you, we had discussed this being the goal of this particular trip multiple times before but at that moment, I got chills and remember my eyes filling with tears. I looked at Pam and said, "That felt like a Holy Spirit Moment". The next day as our first clinic started, my initial assignment was to do triage with my fellow in-country nurses. Becky Vega, my sweet new friend, was acting as my interpreter for the clinic for the day. I saw a few patients, and then an elderly woman with the sweetest smile came and sat down, waiting for me to do her intake. Little did I know how impactful that meeting would be. We began to chat via Becky's help, and she told me that she was 86 years old and then she sadly said, "I have no value anymore." Her crinkled eyes began filling with tears. She literally used the word "value." My eyes filled with tears as I hugged her tight, and I knew this was a significant moment for us both. I told her that to God, as long as we have breath we are loved and valued and He has work for us to do. It was a time of pouring into her the value that God truly sees in her, His love, and I knew this was a divine appointment. I then asked if we could pray with her, and she smiled and agreed. I put my arms around her and Becky held her hand, an incredible connection between women from different cultures coming together in prayer. We prayed that she would feel the amazing love that her Heavenly Father had for her, that she would sense her value to Him, and that she would be uplifted and encouraged in that truth. 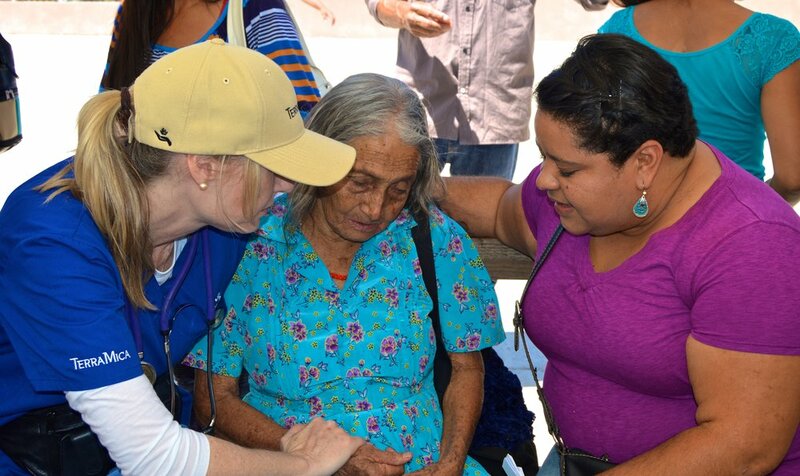 After we finished praying I hugged her again and told her, "I think you are the reason I came to Honduras." She replied, "You are the reason I came here today." Truly it is a moment that I am humbled to be a part of and grateful for the chance to be the hands and feet and heart of Jesus. I am always awed that He takes pleasure in using someone like me to do work for Him. I don't deserve it. Each trip also awakens a new passion in me. Each trip lets me see another need that needs to be filled. It’s another chance to help others find solutions to problems in their own country while maintaining their own unique culture. I pray that God continues to use TerraMica to help others find solutions and improve their own lives. Sometimes we all just need a little help to get started. Sometimes, it starts with simply knowing we are loved and valued by God!